I'll finish with a story. I was at a RWA Conference in Washington that was being held at the Marriott Wardman Park Hotel. I was making my way to a workshop during the height of the conference and came upon a long glassed-in hallway that looked out over the gardens. On either side of the hallway were small conversation areas, chairs set up so that people could linger. As I made my way down the hallway I realized that the people sitting in those chairs were all the Grande Dames of Romance Writers, including Jo Beverley. The further I went, the more in awe I was. Somewhere in the back of my mind I always thought that this is what descending to Heaven would be like, passing all those that inspired you as you went along. 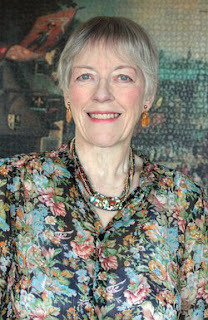 I was greatly saddened to hear about the passing of Jo Beverley yesterday. When you've been reading romances as long as I have, you know who the great ones are and Jo Beverley was one of them. Regency Romance has always been my escape. 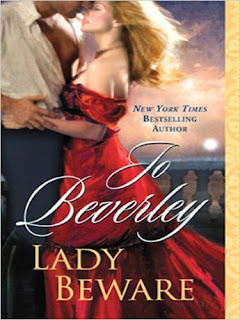 I could never write them, but I love to read them, and Jo Beverley was at the top of my lists. She came to the forefront in the mid-80's with characters that blazed their own path through the book store shelves. There are many authors today who probably wouldn't be allowed to write the things they do if it hadn't been for Jo Beverley and others who were writing at that time. If you want to read more about Jo I've included this link to a great article from All About Romance. If you haven't read her books I suggest you skip on over to Amazon and pick up a few. There are 50 plus to choose from and none of them will disappoint. By the way, I picked Lady Beware because I think it's one of my all-time favorites. Check out the reissue of her Company of Rogues titles!